Having misspellings on your website is bad for your reputation and harms user experience. As part of website Quality Assurance, it is important that you take steps to detect and fix misspellings on your website. Monsido Quality Assurance tool is here to help! For a long time, our Spell Check feature has been in beta. Now, we are finally ready to launch the new version of Spell Check. Here are some of the features you can expect and how to make the most of them so no misspelling ever goes undetected. 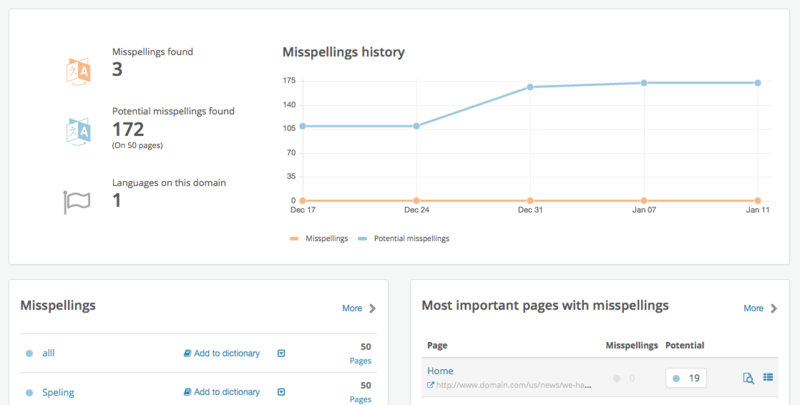 It really couldn’t be simpler to get a complete overview of how your website is doing with spelling errors. Right from the Overview page, you are just a click or two away from solving the most pressing spelling issues on your site! When we first created the Monsido misspelling tool, we only flagged misspellings. We soon realized that this wasn’t good enough. Now, we’ve split flagged words into Misspellings and Potential Misspellings. Potential misspellings are the words which haven’t been confirmed as misspellings yet. Once you confirm a misspelling, you can easily find it in the Misspellings section. This ensures that you are quickly alerted to common misspellings, such as a product name which your copywriters often get wrong. At Monsido, we are all about giving you options and control over how you manage your website. One way we do this is by letting you view errors by page. Now you can do this with misspellings too! 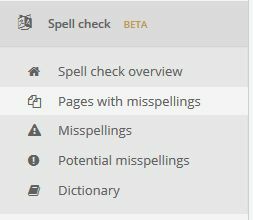 Just select “Pages with Misspellings” to see a list of pages along with each page’s Language, number of Misspellings, and number of Potential Misspellings. From here, you’ve got numerous options. You can confirm the misspelling, add it to your dictionary, ignore it for that page only, or view the misspelling on the page. Every website has some correct words which may get flagged as misspellings. For example, your brand name might be viewed as a misspelling. We’ve made it easier than ever to add these words to your dictionary so they don’t get flagged again. All you need to do is click “Add to Dictionary.” Since the page language is automatically detected, the word automatically gets added to the appropriate dictionary! You also have the option of adding a word to all of your language dictionaries. Monsido is a global company with customers around the world, and many of our customers operate in multiple languages. So, we are really proud that our Spell Check feature now has 39 language dictionaries. We won't list all of our new language dictionaries here, but we would like to point out that you can now choose different forms of English (US, UK, CA, and AU), different forms of German (German, Austrian German, and Swiss High German), as well as many more languages. Having multiple language dictionaries could have gotten messy and caused numerous words to incorrectly be flagged as misspellings. To prevent this, we’ve implemented a powerful function which automatically detects what language is on a page. That way, your Dutch pages aren’t getting flagged misspellings on your mostly-German site, your Spanish pages getting flagged as misspellings on your mostly-English site, and so forth. Unfortunately, our Automatic Language Detector can’t detect the difference between different types of English (US, UK, CA, and AU) right now. US English is set as the default form of English. If your website has English content, please remember to choose your type of English under “Default Language” in the settings. In the case of English, the “Default Language” will override the Automatic Language Detector to make sure your site is being scanned for misspellings with the right type of English. Do you have a website where you talk about foreign politics? But you also have an employee named Ms. Forein? You can see how those two words on your website could cause some confusion! For situations like these – where a word might be a misspelling on one page but correct on another page – we now allow you to ignore words on a single page instead of throughout the entire site. You will see a list of pages where the misspelling is found. Next to each page, you will see two icons. Click on the “Confirm” icon. You will now have the option to “Add to Dictionary” or “Ignore” for just that page. Of course, we still let you ignore a misspelling throughout your entire website too. You just need to go to add the word to your dictionary. Not Quite Perfect, But We Are Getting There! These are just some of the improvements we’ve made to the Monsido Spell Check feature. The feature isn’t 100% perfect yet, but we are getting closer. We hope that these improvements will make it even easier to manage your website. If you have any questions, remember that we are here for you!